As I noted with the appearance of the first pressed steel T-34 turret variant, even though the Soviets quickly decided on producing two versions of the Model 1941 T-34 turrets – cast and welded – even with new casting techniques using steel molds they were hard pressed to keep up with production requirements. Another source of turrets was required. As a result, in October 1942 the State Committee on Defense (GKO) ordered the UZTM factory to produce pressed steel turrets as they could double the speed of production by this method. UZTM produced both the cast turrets as well as the pressed steel turrets in parallel and sent out to other T-34 factories for production, but most commonly they were seen on Factory No. 112 (Krasnoye Sormovo) chassis. When production ceased on 1 March 1944 UZTM had produced between 2,050 and 2,062 of these turrets. They were used for both regular T-34 Model 1942 tanks as well as the Model 1943 with the commander’s cupola. While Factory No. 183 built more than 5,700 tanks with the cupola there is no way to determine how many actually had the pressed steel UZTM turret; ditto the Krasnoye Sormovo tanks. The latter did produce its OT-34 tanks with this turret, however. 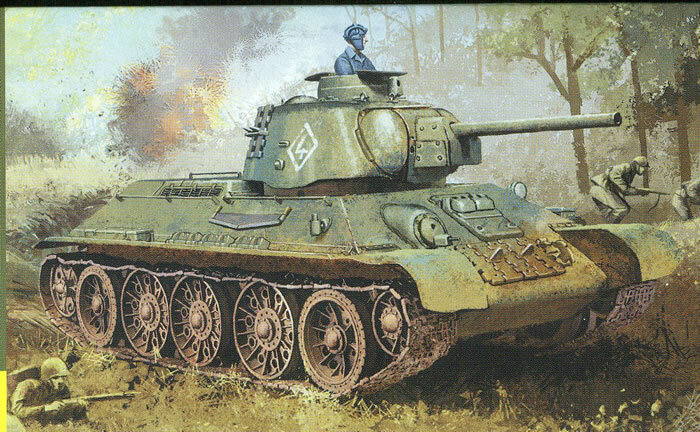 This tank has always been a popular variant of the T-34 due to its unique turret shape, and now DML has updated its earlier Model 1942 pressed steel turret kit (No. 6487) with this modified turret and what appears to be a new production cupola, The name “Formochka” puzzles me, for it is not used by any contemporary Russian source nor any modern Russian historian, but only as a slang term (also used for “vacuform” as well) on Russian modelers’ websites. DML continues to use it which is unfortunate. Be that as it may, the kit provides all of the parts from the previous kit with a new mold turret roof to accept the new cupola. The rest of the older turret bits are retained, but no aluminum barrel is provided. The roof parts are integral. Two different finishing directions are provided: Unidentified Unit, Eastern Front 1944 (4BO green, white diamond 4); 119th Independent Engineer Tank Regiment, 1st Baltic Front, Operation Bagration 1944 (4BO green, “David Sasunskiy”, white diamond S, whte 46). A targeted set of Cartograf decals are provided. Overall, this is a nice execution of this variant of the final 76mm version of the T-34.